Everyone is familiar with the story of IPA: during the glory days of the English Empire, casks of beer brewed in Burton--the brewing capital of England and the city that perfected pale ale--were sent across the globe in the holds of ships. The jewel in the English crown was India (which was also the source of many English jewels), and the viceroy needed fresh, tasty beer to cut through the dust of the Gangetic Plain. Thus was brewed a strong pale ale, liberally hopped. The strength kept the beer from wilting under Indra's heat, the hops innoculated it against the Subcontinent's abundant microbes. It became known as India Pale Ale. You may not be as familiar with America's role in the style's durability. Bridging the gap from the time of the first British IPAs, a brewery founded in Albany, New York by Scottish immigrant Peter Ballantine began production of IPA in 1840. Ballantine's became one of the larger regional breweries by the late 19th Century, and survived prohibition by selling malt syrup to homebrewers. Shockingly, one of the beers it made throughout the 20th Century was an IPA which, in the early 1960s boasted an original gravity of 1.070 and 60 IBUs. Midcentury America was producing IPAs like Burton once did. Over time, the strength grew weaker, as did the company until, amid red ink in 1969, the brewery sold out. Ballantine's still exists, but went the way of Weinhard's. It is now owned by Miller. All of this preamble is to lay the ground for why Terminal Gravity is an Oregon classic. Many breweries hedge their bets and offer IPAs that won't overwhelm the drinker with alcohol and hops. Some of these, notably BridgePort, are amazing. But they wouldn't survive in an English ship on the journey to Injah. 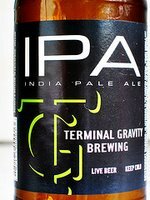 Terminal Gravity would, and I imagine it would arrive tasting mighty good. Unlike Ballantine, Terminal Gravity has ridden IPA to success, somehow finding distribution throughout Portland (the brewery is located in Enterprise, in the Wallowas in the Northeast corner of the state). Since I took the picture above, the brewery has gone through an expansion and outgrown its brewery/pub bungalow, ensuring the capacity to keep sending its IPA on the somewhat less ardurous journey in a distribution truck down I-84 to the Rose City. Pours a surprisingly dark, deep amber/orange with a nice head that, not suprisingly, doesn't survive the alcohol long. Malt and alcohol dominate the nose, hops singing harmony. It's easy to brew a big beer adequately, but hard to do it well. Keeping the various elements in balance is the trick, and TG hits it right on the head. It's a burly beer, with a thick mouthfeel and warming alcohol. Hops seem to run along a continuum of flavor that starts with the alcohol and ends with a crisp citrusy note. The aftertaste includes a distinctive quality I searched for a long time to identify. Maybe chicory. It's a beer like a meal--so hearty and rich that it feels like you're drinking something as hearty as soup. It even warms the belly. I could find no more information than was available on the bottle: 6.7% abv. You wouldn't question a beer that came halfway around the world, and I guess Terminal Gravity assumes you won't question them, either. Fair enough.